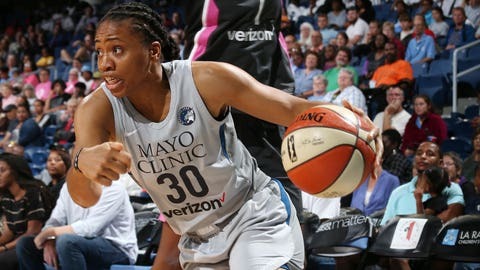 Minnesota sent guard Tanisha Wright to the New York Liberty in exchange for a 2020 second-round pick, the team announced Thursday. The Lynx signed Wright last March in free agency to give them depth at guard behind Lindsay Whalen. But after Minnesota drafted two guards Wednesday and traded for another, general manager Cheryl Reeve opted to send Wright packing. In her one season with the Lynx, Wright averaged 4.3 points, 1.6 rebounds and two assists per game. She was Minnesota’s top 3-point shooter (percentage-wise) last season, cashing 19 of 48 attempts from deep (39.6%). Wright, the 12th overall pick by Seattle in 2005, played for the Storm (2005-13) and the New York Liberty (2015-16) before arriving in Minnesota last season. On Wednesday, Reeve traded the rights to second-round pick Natisha Hiedeman (18th overall) for Lexie Brown, a Connecticut guard entering her second WNBA season. Minnesota’s 21st season in the WNBA tips off May 25 against the Chicago Sky.